Rule Pumps Charge N' Flow Pump Kit - Rule Pumps Charge N' Flow Pump Kit 280 GPH, 12 VDC RB280KR. Rule Pumps Charge N' Flow Pump Kit 280 GPH, 12 VDC RB280KR. 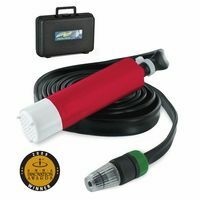 Rule Pumps Charge N' Flow Portable Pump Kit 280 GPH, 12 VDC, RB280KR. It’s rechargeable, submersible and used to dewater bilges, as a deck shower, for wash downs, or as a transfer pump. It handles hot or cold water, seawater, antifreeze and diesel. Includes pump, 8' hose, spray nozzle, filter, battery, charger and two types of adapters. The pump handles up to 100 gallons of water per battery charge. Not for use with gasoline.